Sycamore leaf shadows on the tree trunk and on the ground, captured while walking the dogs. Shadow Shot Sunday is hosted by Hey Harriet, go over there to see all the Shadowy people. The leaves give a look of lace.. Shadowy People! Hey! I resemble that remark! Trees make the best shadows, don't they? Mine is a tree with a small shadow, too. Nice shadow, leaves and trees..love 'em. Very cool that you captured the shadows on two surfaces. I like how crisp they are on the tree trunk and soft and blurry they look on spread across the grass. I love that the shadows wash over the ground and up the tree!! Nice shot! I do especially like the shadows on the trunk!! 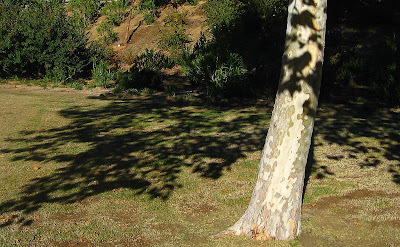 Nice green shadows - we always love tree shadows! This is lovely. I especially love the shadows decorating the tree!